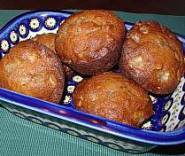 A deliciously "spicy" muffin filled with pears and chopped pecans, nutmeg, cinnamon and ginger. What a wonderful treat to serve your family or friends on a chilly autumn or winter's morning. Preheat oven to 375 degrees F (190 C). Spray 18 muffin cups with cooking spray, or line cups with muffin cup liners. Combine diced pears and both sugars in medium bowl; toss well. Blend oil, beaten eggs, and vanilla in large bowl. Combine flour, baking soda, cinnamon, nutmeg, ginger, and salt in another medium bowl. Stir pear mixture into egg mixture; mix in dry ingredients. Fold in raisins (or dates if using) and pecans, do not overmix. Spoon batter into prepared muffin cups; about one-half to two-thirds the way up. Bake muffins in prepared tins for 20 to 25 minutes in preheated 375 degree F (190 C) oven. Remove from oven and let muffins cool in pan for 5 minutes. Transfer muffins to a cooling rack to cool completely. Made these this morning. And they're really tasty. Thanks for the recipe.